I started making props in 2010, inspired by the portal-gun replica made by Harrison Krix (Volpin Props). He posted his build online in detail, with pictures showing how he made it, step by step. I was amazed by his end result; a replica forged from PVC pipe, foam, and a little bit science. I remember staring at my computer screen and thinking to myself that it didn’t look that hard and that I could build one too. Little did I know that I was getting myself into a new hobby that I would still be doing seven years later. Over those seven years, I have learned how to make props using various tools, materials, and techniques. Most of these I learned from various people on the Replica Prop Forum, makers and cosplayers on YouTube, and personal trial and error. I also learned how not to create props by making various mistakes and ruining hours of work, cursing my hobby and swearing that it would be the last prop or cosplay I made. (Obviously that was a lie, shouted out of frustration at whatever I was failing at that day—something my long time partner in prop-making Nick Larson can attest to.) My lesson number one of cosplay and prop making is that mistakes will happen. Learn from your mistakes; we all make them. Cosplaying is a process that does not happen overnight, so take it day by day and have fun! 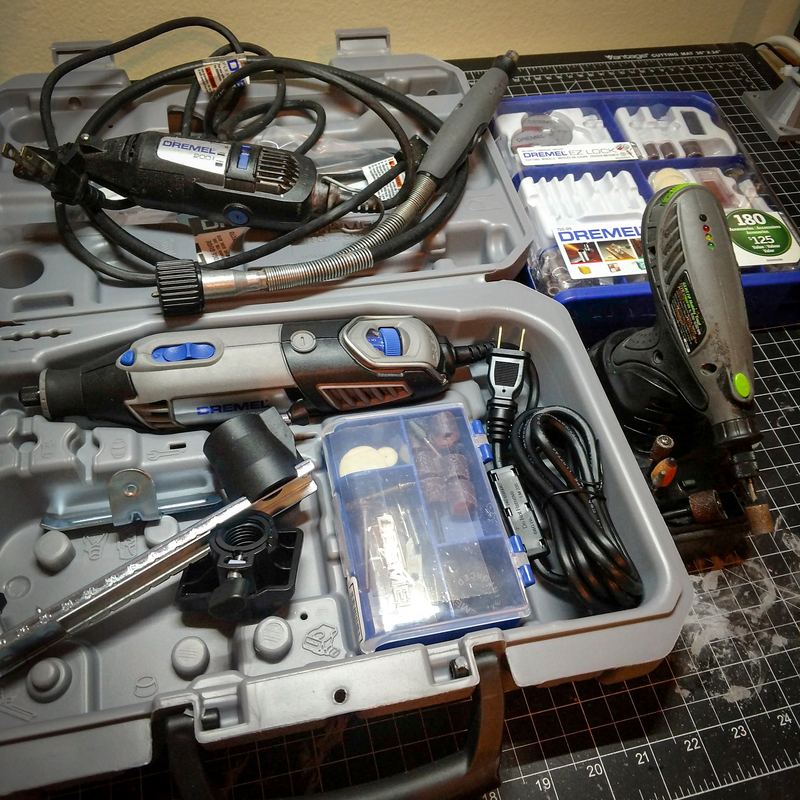 In this article, I’m going to focus on basic tools for a cosplayer’s toolkit. These are general tools that you can apply to most materials and will help you get started in the world of making and cosplaying. A rotary tool is one of the most versatile implements you can have in your arsenal. Most tool brands make their own versions, but Dremel is the go-to name brand for rotary tools. One of my first cosplay-related purchases was a two-speed Dremel 200 and a flex arm. I told myself I could get one of the nicer models with variable speeds when it died, but that never happened. I finally caved this year and bought the Dremel 4000 when it was on sale on Amazon. It is more expensive, but having multiple speeds gives you more control over your crafting. Rotary tools use different bits to do different functions—they can be used for sanding, polishing, cutting, grinding, drilling, and many other things based on what bits you purchase and what your heart desires. Dremel also makes extra add-on attachments for their rotary tools, such as a flex arm, router table, and drill press. The flex arm allows for better control, and I highly recommend it as an add-on to improve your precision. This one may seem like a given, but this is something you can never have too much of. Sandpaper comes in different grits, with the lower numbers being more coarse and higher grits being more fine. A typical project of mine starts with 80- or 120-grit sandpaper and works up to 400. I usually keep a decent supply of 80, 120, 220, 320, and 400 on hand as well as several sheets of 600- to 2000-grit for occasions when I need a glossy shine. 3M makes durable sandpaper that can be used for dry or wet sanding as well as a line of sanding sponges. A handy trick I learned is to glue a piece of sandpaper to a paint-stirring stick to create a sanding stick. This allows you to work faster and more cleanly and makes the sandpaper last slightly longer. Files are also a must for hard-to-reach places. Some of the materials used in prop making and cosplaying can cause irritation or damage to your respiratory system, and a respirator helps keep your lungs safe from harm. These come in many shapes and sizes, but one common respirator that can be found at most hardware stores is the 3M 6000 series half face mask. You can buy this as just the mask or as a kit with the filters and cartridges. Both are required to filter harmful chemicals out of the air, and different cartridges are available for different applications. Organic vapor cartridges and P95 filters work for spray-paint and Bondo fumes. There is a helpful guide to respirator and cartridge selection on 3M’s website. Adhesives are available in a wide range of products that can be overwhelming at first. My personal favorite is Insta-Cure by Bob Smith Industries, paired with Insta-Set—a catalyst that accelerates the curing of the glue—as necessary. Super Glue can be used for most applications and is a general purpose adhesive. Another type of adhesive that no toolkit should be without is a hot-glue gun and glue sticks. There are many brands, but a good starting point is a “mini” hot glue gun, such as this model. Hot-glue guns get very hot, so keep away from children and animals, and always use caution when working with them. One of my favorite cutting tools is a utility knife. This tool comes with a segmented blade that snaps off and can be easily replaced. Paired with a sharpening stone or sharpening steel, your blades will stay sharp and help you make precision cuts. These items will help you get started on your adventure in cosplaying! Always use caution and proper protection when crafting. Next time, I’ll be talking about different materials used in cosplaying and prop making. Have any favorite tools or an idea for an article you’d be interested in reading? Comment below or send me an email—I would love to hear them!